Because of the FUD-creating information spread around by security companies such as McAfee, Android is thought of as a virus-prone mobile operating system which, like Windows, needs an antivirus. If you read my editorial on Android Security from 3 months ago, you’ll know that I believe that Android devices do not need any sort of anti-malware app provided that you follow a handful of common sense tips. Popular security companies like ESET, Kaspersky, Norton, Avast! already have security apps on Android and, today, we received news of Avira joining the club with their new anti-theft app called Avira Free Android Security. Check it out after the jump! Your smartphone may be replaceable, but what about its contacts, messages, photos and private accounts? Install Avira Free Android Security to protect your data and increase your chances of being reunited with your device. We’ve tested the app on a Samsung Galaxy S II on Android 2.3 Gingerbread and can confirm that it works as advertised. 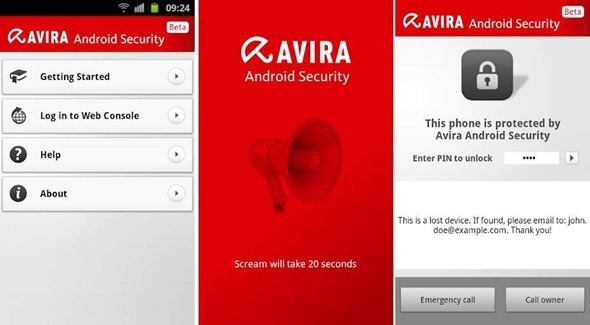 Avira’s security app comes with standard features like being able to make your phone “scream” so you can find it even if it is in silent mode, remote lock, GPS tracking, basic battery life monitoring etc. There are unique features like “Call the Owner” which lets the person who finds your locked phone call you from the lockscreen and being able to manage multiple devices through the app’s Web Console using a single account. Avira’s powerful anti-theft app is currently in beta and is available for free. Download it from the link embedded below! Don’t forget to let us know what you think of Avira Android Security in the comments section over on our Facebook and Google+ page.